Wednesday, Oct. 1, 2014. 7 pm. Yours truly, mystery writer, Caryl Dierksen, and free-lance journalist and author, Elizabeth Harmon will be talking about how to gear up for NaNoWriMo (National Novel Writing Month). There will be an opportunity to purchase autographed copies of my latest book, TRUE blue after the presentation. Follow along for reviews and insight into the writing of TRUE blue and enter to win a $20.00 Amazon Gift Certificate! Follow and enter for a chance to win a $10.00 Amazon Gift Card! For info on the Marriott, click here. Look for the TRUE blue Virtual Tour coming May-June, 2014! You can still stop by these sites and check out not only their reviews of my books, but all the other books they have reviewed. July 16th– Interviewing with Margaret Butler on Musaling Monday . July 1- July 4– 4th of July Blog Hop! June 23 and July 3 — Musa Blog dates– A new release blog featuring freefall on the 23, and it’s Tasty Tuesdays on July 3rd featuring Door County cherries. The Tasty Tuesday blog is inspired by the setting in freefall and my many vacations in the area! June 21, 2012 — In honor of freefall’s release, I will be doing a blog with Musa Publishing Blog featuring an interview with Kate and Everett, freefall’s hero and heroine. June 14, 2012–The Susan Rae 2012 Blog Tour is coming in July and August, just in time for my new release, freefall, and summer reading fun! The blog schedule will be up next week! –Spring Fling was lots of fun and very inspirational, too! 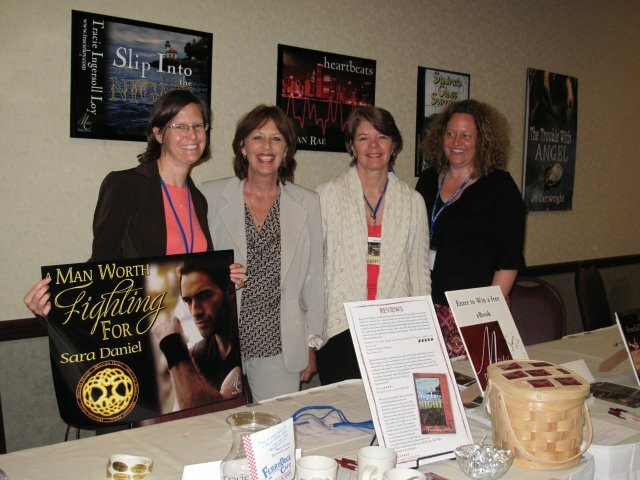 Here is a pic of me and my fellow Musa authors, Sara Daniel, Tracie Ingersoll Loy, and Mindy Hardwick at the book selling event. — Spring Fling is in the air! Chicago North RWA will be hosting it’s Spring Fling writer’s conference Friday and Saturday, April 27-28 at Chicago Marriott NW in Schaumberg. Your favorite romance authors from CN will be signing copies of their books on Saturday, the 28th, from 2 to 3:30pm. Fifty-one romance authors, including yours truly, will be there. Okay, some of us are e-book publishers, but we will be signing nice postcards and giving you info on how to download our books. Please come out and spend some time with a really nice bunch of authors! For more information on the signing, and Spring Fling in general, check out this site: http://www.chicagospringfling.com/ .